Are your Christmas decorations up yet? Today’s post is running late, we’ve been hanging up our Christmas decorations. It’s one of those tasks that I start dreading in October and then realize that I truly love doing it. 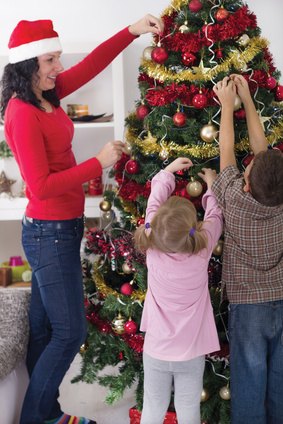 I have vibrant memories of decorating the tree with my parents. Dad would take us outside to play in the snow and build igloos [with that weird brick shaped bucket] until we were frozen. Then Mom would call us all in for hot chocolate and the evening’s Christmas show. Rudolph was always my favorite; gotta love the underdog. In the short time that my sister and I played outside with Dad, my Mom had transformed our comfy home into a magical feast for the eyes. She loves decorating and even though we’re all grown now, she remains committed to the holiday pomp and circumstance. A very miniscule slice of this Martha Stewartism rubbed off on me. I have always wanted to make the holidays special for Just Plane Dad and Beloved. I jump at the chance to create memories through events or just bedazzling our home with color and sparkle. Each year, we rotate the tree’s Christmas decorations between our favorite picks…this year it’s a Chicago Bears tree…guess whose? Sometimes it’s a pink candy colored confection and my personal favorite, an elegant brown, silver and gold stately Fir. Underneath all of that beautiful trimming, hides a dark secret. The tree is fake or faux as is acceptable to say now, and although we’ve had it ten years, it only cost $20 on sale. It ends up beautiful and is a huge source of my nostalgia no matter what its humble beginnings were. I think back to the super-hyped excitement Beloved used to show for the tree trimming event and tears well up in my eyes. The wonder of Christmas had her just beaming and high on hopes and wishes for things she’d asked the jolly elf for. It would take hours for her to select the placement of ornaments all while chatting away about the North Pole, reindeer and presents. She loves the presents! Today, she still enjoys the house being decorated and the thought that Christmas is near, however she usually meanders downstairs at the end of the decorating. She’ll put a few final touches here and there, give the official countdown of days and then disappear again to her room as teenagers do. This year, she asked for her own tree in her room and we obliged, even though I cried inside; I didn’t realize a store bought tree could elicit such emotion. She chose a beautiful color and clearly takes after her grandmother in the decorating arena. She has taken a step farther away from us. All was not lost though. While the door remained close during the actual trimming of her tree, she bounded into the room and announced that me and Just Plane Dad were in for a treat! She had us close our eyes, hold hands and led us into her room. she proudly showed us her masterpiece. It was stunning, it was decidedly hers, it was this year’s memory.